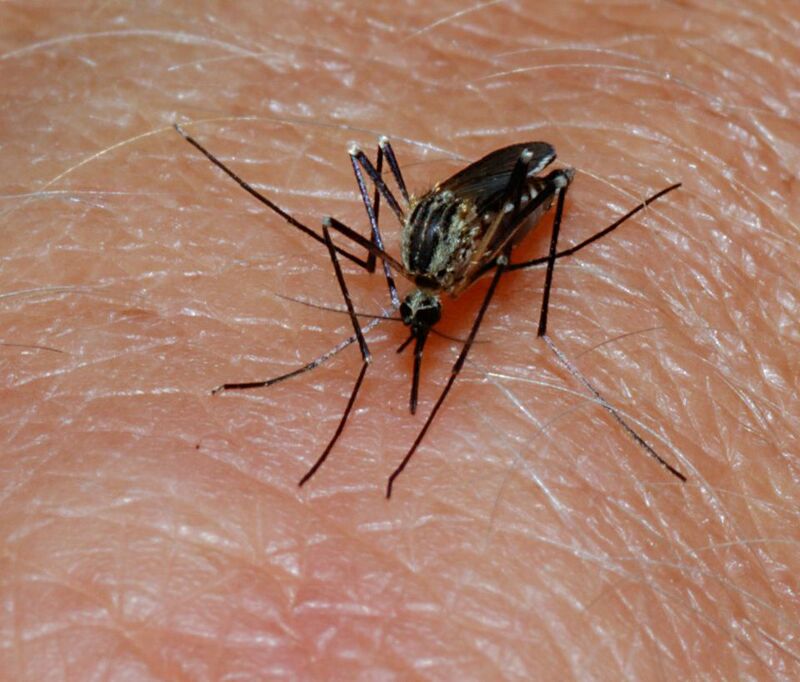 One of the most dangerous natural residents of Michigan is the mosquito. While naturally annoying and bothersome, the mosquito’s real danger goes well beyond the prick of a sting or the resulting, itchy welt. Mosquitoes are dangerous because they carry and transmit disease -- well, not all mosquitoes. It is only the female who bites because she needs blood to develop eggs. The males are relatively innocuous and feed on plant nectar and juice. While mosquitoes act as a carrier in transmitting disease, the original host is usually a bird (or occasionally a horse/deer). In Michigan, the usual bird suspects include crows, robins and blue jays, which is why their populations are monitored along with that of the various mosquito species by health officials. Certain types of encephalitis can be spread by mosquitoes, including West Nile Virus. Dog heartworm has also made its way into Michigan as a result of the mosquito. Michigan has about 60 species of mosquitoes buzzing around within its borders. These in turn fall into three main genres or types: permanent water mosquitoes, floodwater mosquitoes -- summer floodwater mosquitoes are the most common in Michigan -- and artificial container/tree hole mosquitoes. As the names imply, all three types require some type of standing water source to mature, such as ponds, flooded areas, old tires and buckets. Rest assured there are several organizations conducting mosquito surveillance and making decisions regarding mosquito control in Michigan. And there are several methods of mosquito population control. It should be noted, however, that the best means of population control is to limit the mosquitoes’ breeding grounds and/or catch the little bloodsuckers during the larval stage of their four-stage development when they are concentrated and immobile. Of course, the larvae stage also provides a natural food source for a lot of Michigan wild life, so the state has a delicate balancing act to perform in assessing disease-risk threat. Avoidance: Mosquitoes like swamps and forests and are most active on still, humid days. Their preferred time of day is dusk to dawn, which means they can be craftily avoided by limiting time spent outside. To help figure out when mosquitoes will be most bothersome, check out The Weather Channel's daily forecast of mosquito activity for Metro Detroit. Use of repellants: Commercial skin repellants that contain DEET are helpful -- Michigan publishes a pamphlet on its proper use – as are Citronella candles. Fashion control: Consider your clothing, hygiene and perfume. Covering exposed skin with long sleeves and pants can help to prevent bites. Female mosquitoes are attracted to Carbon dioxide, warm bodies, body odor, lactic acid, dark-colored clothing and some perfumes and deodorants. Environmental Control: Eliminate the places where mosquitoes breed by thinking out landscape design to avoid shallow-water catches and dumping water out of artificial containers. Special film covers and tiles are available for decorative fountains and ponds. It is also helpful to properly grade all yard areas to allow proper water drainage, reduce over-grown vegetation and use yellow light bulbs in outside lighting fixtures. Insecticide: Larvicides and adulticides work best at night and when administered by a professional. Predators: While bats, swallows and dragonflies feed in part on mosquitoes, the truth is they don’t put a sufficient dent in its population to be considered a control for it. Mosquito fish and certain types of bacteria, however, are useful for that purpose. Outdoor bug zappers: The familiar blue light and high-voltage zap does little to affect mosquito population, but does provide a certain amount of satisfaction to listening humans.